Do you want to get married in Bali? We can accomodate up to 32 overnight guests at our 4 villas. Facilities include Restaurant, Bar, Dining area, Tennis Court, Swimming Pool. We can arrange everything for your special day. Do you want the ceremony on the beach or at a cliff top location? 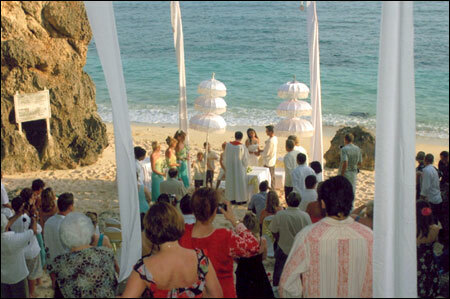 Just Email us your details sales@balisurfingcamp.com and we will make all wedding arrangements. Our accomodation is set in a walled 3000M2 area with excellent views of the surrounding tropical vegitation. We are located at Padang Padang, Bukit, Bali very near to Bingin and a short drive from Uluwatu. Persons of any nationality may marry in Bali, providing they hold one of the five religions recognized by Indonesia (Buddhism, Catholicism, Hinduism, Islam and Protestantism). Copy passport of both bride & groom to be. Certificate of No Impediment to Marriage from your embassy or consulate in Indonesia (some countries have their consulates in Bali) – for Australian, USA and British citizens, this can be arranged when you get to Bali. Copy of the birth certificate for both bride and groom to be.